After the sell-out success of the first run of dates (including a stellar New Year’s Eve party), east London’s Soul Revolution club returns for more regular action this year at The Bedroom in Rivington Street, Shoreditch. 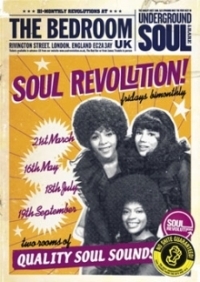 Set to take place bi-monthly from Friday March 21st, Soul Revolution unashamedly peddles upfront soul sounds for dancers. A northern & rare soul main room is provided to aid this, with resident DJs James Trouble, Val Palmer, and Mick H alongside special guests spinning uptempo soul 45s. First guest up is Karl Heard from the Burnley Allnighters. Meanwhile Manchester’s Steve Cato plus guests host the smaller, more intimate Soul or Nothing Suite, playing Jamaican soul, r’n’b, beat ballads, cross over, and experimental ’60s sounds. What’s more, the venues kitchen will be open on the nights to provide some soul food to accompany the soul music! On top of the dates already announced we should expect a three room allnighter just before Christmas to really get those soul walls tumbling down. Tickets are £8 in advance from the Soul Revolution website here. Advance booking is recommended to guarantee entry.